This month’s spotlight shines on Lisa Simpson (@DrSimpsonHSR), President and CEO of AcademyHealth and host of this month’s #healthITchicks tweet chat on Wednesday, March 21 at 1pm ET. My career has always focused on improving health and healthcare by using better evidence – and you need data to generate that evidence. In the last 25 years, I have gone from rolling my eyes at the alphabet soup of HIT-related topics (SNOMED, HL7, ANSI, CCR, etc.) to being a passionate cheerleader for the fundamental importance of leveraging technology and data in improving patient outcomes and health system performance. Has your work in the field helped to improve patient care? I would like to think so! My work has been about creating supportive policies and systems so that patients and clinicians can work together to improve outcomes. I have generated research findings about where care falls short, particularly in child health. I have worked with partners in the public and private sectors – at AcademyHealth and in prior jobs – to get those findings to decision-makers. And I have helped to prioritize and fund research about how to improve care. What health IT development has you excited about its potential to improve care? Hmm, so much to choose from … digging below the hype cycle, what is most energizing to me are those technologies and approaches that are consumer- (and patient-) facing and support decision-making to get the right care at the right time in the right place for the right patient. At this stage of my career and personal journey, I find the ability to support the development of new professionals, especially young women, incredibly gratifying. I sit on various national groups where I get to interact with, and learn from, talented and diverse young people. They see opportunity and solutions where it is easy for others to become mired in all the reasons why progress cannot be made. Answering their questions about balancing work and life, and being a woman in leadership always helps me reflect on my own life and the lessons I have learned. And continue to learn! After all, to paraphrase Kierkegaard, life is lived forwards, but understood backwards. When it comes to personal and professional development, who or what has had the biggest impact on yours? What resources would you recommend to women in health IT? Before I reached my early 30s, I had no mentors. During my post-doc at UCSF, I learned the value of mentors and have since cultivated several key mentoring relationships. Having trusted advisors who are willing to ask you the tough questions, listen and occasionally give pointed feedback is invaluable. When I started at AcademyHealth seven years ago, I began working with an executive coach and that too has been incredibly worthwhile. Finding physical and mental time for reflection is critical. Finally, from a financial standpoint, getting expert advice when you negotiate a compensation package is essential. Oh, where to start … Build a robust professional network and nurture it. It will stand you in good stead no matter what you do. If you are clinically trained and moving into other roles, try to maintain some clinical practice. I am a pediatrician, and when I stopped practicing even part time, no one advised me against that choice. The reality of patient care keeps you grounded. It also gives you even more credibility when recommending changes to health systems. Finally, I think it is so important to be generous – with your ideas and your opportunities. I have learned that paying it forward is not just the right thing to do, it feels great! 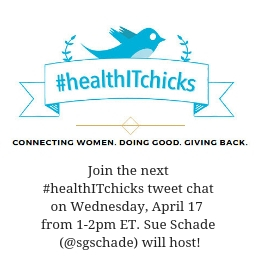 What are you looking forward to chatting about during the #healthITchicks tweet chat on March 21? What are the most promising trends in healthcare technology and why? What characteristics do today’s high-performing health systems share? Share examples! What role should the federal and state government take in promoting healthcare transformation? What role do data and technology have in reducing disparities and enhancing equity in healthcare? Can mHealth Interventions Reduce Health Disparities among Vulnerable Populations? Just for fun: What is your favorite vacation getaway spot? A beach. Almost anywhere. But I especially love beaches in French-speaking countries – Provence, Tahiti, Martinique. I grew up in many francophone countries and the combination of sun, soothing waves and delicious food nurtures my soul! And is part of the reason I did my masters and residency in Hawaii! Hmm. So many options. “Cutting for Stone” by Abraham Verghese. It brought back many memories of a summer I spent in the Ivory Coast during medical school working in a mission hospital. “When Breath Becomes Air” by Paul Kalanithi, because its eloquent yet simple prose focus you on the patient experience at its most elemental, and reminds me of our tremendous human frailty. And anything by the Heath brothers, because they are so good at taking complex issues and crafting memorable narratives that inform our actions and “stick”! That is a skill we are always striving for in my field – how to take complex research findings and communicate them effectively. Join Jenn Dennard and Lisa Simpson (@DrSimpsonHSR) on Wednesday, March 21 at 1pm ET for the next #healthITchicks tweet chat. You can also connect with us on LinkedIn via the #healthITchicks group.